Amazon is the 5th most admired company in the world. How did it become so successful so quickly? Strategy! Investing in the right plans at the right time and staying the course! In this article we highlight Amazon’s strategy development model and the external assessment tools it used in helping it to formulate and select top strategies. In Strategic Planning Samples – Amazon we review the purported tools that Amazon used to conduct an internal assessment. Amazon embraced what is known as a “design school model” of strategy development. Despite the title, the model is simple to understand and can be highly effective. It is the one used most by professors and consulting organizations. The diagram below is Henry Mintzberg’s illustration of the model. Organizations often struggle in finding a compelling competitive position. Successful organization can begin to drift away and total fail at what it takes to be successful. This tool can begin to help an organization get into the game. The design school model calls for both external and internal appraisals. An external appraisal helps an organization to understand threats and opportunities that are out there in the market. The internal assessment helps the organization to understand its strengths and weaknesses. The “Strengths, Weaknesses, Opportunities and Threats” (SWOT) tool is one that most people are familiar with and stems from the design school model. (S) Social factors: includes social trends, population growth rate, age distribution, career expectations, etc. Supplier Power: How powerful are your suppliers? Is it easy for them to drive up their prices and are you stuck? If there are a number of suppliers providing the same product at the quality and price you want, then the suppliers don’t have much power. However, if the supplier provides a unique product that others can’t compete with, then they have more power. Buyer Power: How easy it is for buyers of your product to drive your prices down? If what you provide is unique and in demand then you are in a good position. Otherwise, you may need to compete from a price perspective. Competitive Rivalry: How many competitors do you have? How capable are they compared to you? If you provide a unique product or service that others can’t match, then you have competitive power. Threat of Substitution: Can your customer find a substitute product to yours to get the job done? The ideal is a product that can’t be substituted. Threat of New Entry: How hard is it for people to enter your market and compete with you? Your advantages may be patented products, economies of scale or complexity. Amazon has hundreds of competitors. The challenge is what ones to focus on. They focused on large-scale internet retailers that offer a broad range of products. This exercise helped Amazon to better understand who their competition is. Ebay and Wal-Mart are examples.Global Internet Trends The internet is Amazon’s key channel. The 20 top countries in internet usage, and grow patterns were identified. This is a matrix used to screen portfolios of business units. 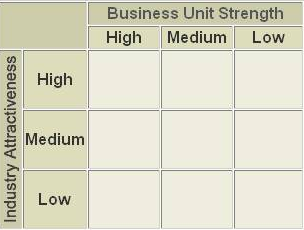 Both the attractiveness of the industry and the strength of each business unit within the industry is plotted. Here is what the matrix looks like.